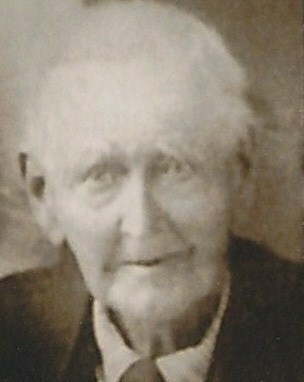 FREEMAN REID (REED) (1816 – 1839) was born in Oglethorpe County, Georgia the youngest son of Jacob Reid and Elizabeth Mary Staton. Christopher Columbus Everett Reid (1837 – 1864) born in Pike County, Georgia. Christopher married Matilda Caroline Brown 17 Feb 1856 in Troup County, Georgia. Freeman died in 1839, cause of death unknown. Widowed wife Nancy married Patrick O’Kelly 6 Jan 1843 in Greene County, Georgia. It is not known how long their marriage lasted; however, according to census records, Nancy and her son Columbus were living alone in Greene County, Georgia in 1850. Christopher Columbus Everett Reid and wife Matilda Caroline Brown with infant child. Picture courtesy of Jerry Tidwell, author of “One Family’s Journey through Time”. Gresham Christopher (Bob) Reid and Susan Columbia Welch. Gresham is a son of Christopher Columbus Everett Reid. Image courtesy of Shelley Baltar. Madison Wilbur Reid and Etna Frances Pitts Wedding Photo 1916. Madison is a son of Gresham Christopher Reid. Image courtesy of Shelley Baltar. Christopher Columbus Everett Reid married Matilda Caroline Brown. 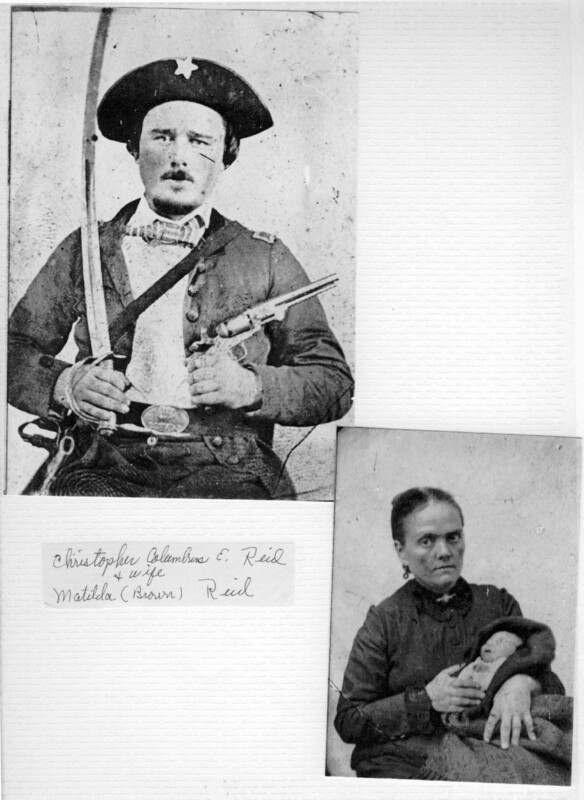 They had two children, both sons: Gresham Christopher Reid and John Wesley Reid. Christopher Columbus Everett Reid joined Jeff Faulkner’s Inf. unit in Troupe County, GA on Aug 5, 1861. May 9, 1864 combat at Sugar Creek near Resaca, GA. May 14-15 battle of Resaca, GA. May 17, 1864 captured at Calhoun, GA. May 22, 1864 appeared on roll of prisoners of war, Nashville, TN. 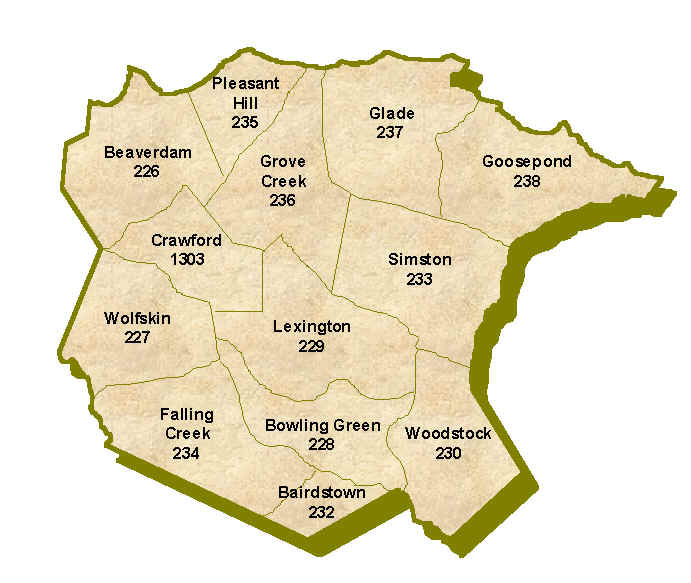 May 23, 1864 arrived at military prison, Louisville, KY. May 25, 1864 arrived at military prison, Alton, IL. Nov 30, 1864 died at military prison, Alton, IL. Cause of death: Phthisis (old term for pulmonary tuberculosis). All prisoners who died on Nov 30, 1864 are buried in common graves at Alton, IL. Christopher Columbus Everett Reid’s name is listed on marker at cemetery at Alton, IL. Gresham Christopher Reid married Susan Columbia Welch. They had 8 children. He died on Jul 20, 1918 from burns suffered in an explosion at the Quenalda graphite mines. He is buried at Little Pole Bridge Cemetary in Clay County, AL. Susan Columbia Welch Reid died in 1931 and is buried at Forest Hill Cemetery near the airport in Birmingham. 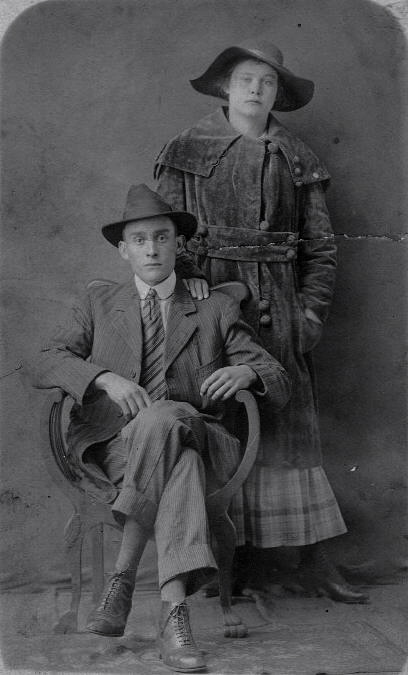 One of their 8 children was Madison Wilburn Reid, born Feb 21, 1892 in Clay Co, AL. He married Etna Frances Pits. He died on Mar 7, 1934. One of the children of Madison and Etna Reid was James Alfred Reid, born Jun 9, 1918, died Nov 5, 1982. I (David Alfred Reid) am a son of James Alfred and Elizabeth Stanbery Reid. Thank you for providing this information on Christopher Columbus Everett Reid and his descendants. This will be helpful to many who suspected a connection to CCE Reid, but were not certain about his wife and children. I am the granddaughter of Jean Reid Smith (daughter of Madison Reid and Etna Pitts). I have come across some photos of Gresham Christopher Reid with his wife Susan Columbiana Welch and Madison Wilbur Reid with his wife Etna Frances Pitts. I would love to add them to this site. Shelley, thank you for visiting the site, and for offering to share the photos. They will make a nice addition to the site. How do I upload them to the site? I am the granddaughter of Samuel Eugene Reid, Madison Wilbur’s brother. 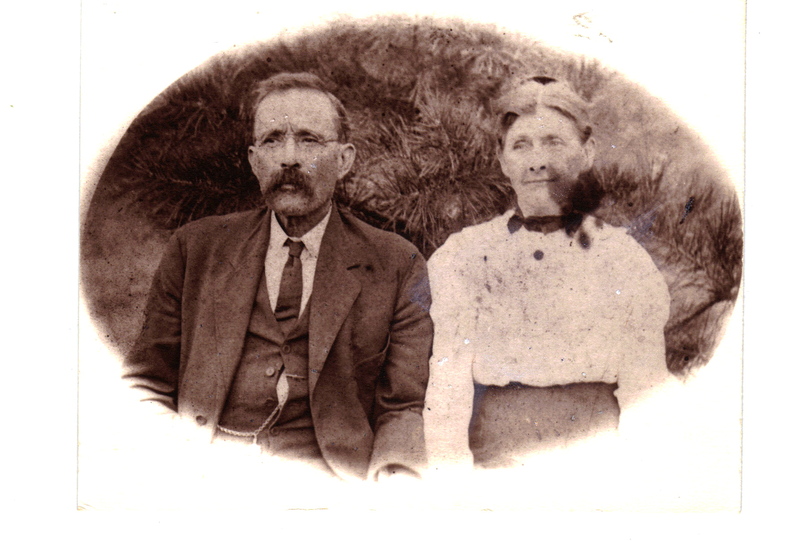 I am so THRILLED that you came across the photo of our Great Grand Father and Great Grand Mother. My Mother Eleanor Ruth Reid Slade and Grandmother Elizabeth Pauline Roper Reid were very tight lipped about the family. We saw a couple of photos here and there of the Roper side but not of the Reid side. Please, if you happen to come across anymore or even stories? Could you please add them here or send them to me at my Ancestry.com site leslieslade1965? Once again, thank you so much for sharing these family treasures!